M138 | 999 m. | 3278 ft.
We continued southwards and after a kilometre the ridge became more defined. Nice views of the crags of Sgurr Breac, the gentle, curving ridges from Tomain Coinich to both Munros and of Loch Toll an Lochain were the reward for our efforts. Snow covered the ground in many places once we crossed the 750m contour. Then the summit of Tomain Coinich was gained, we turned west and descended a few dozen metres to the beallach where the steepish ridge leading to A’Chailleach begins. From the beallach to the summit the whole ridge was covered in snow – frozen in some places, soft in others. At the summit cairn the wind was strong and it felt quite cold after a while. The views of Fisherfield and An Teallach were nice, though. So after a few minutes of watching the scenery we retraced our steps to the beallach where we had a nice break with sandwiches and tea. Then we bypassed the summit of Tomain Coinich on its southern slopes and climbed to the flat summit of Sgurr Breac, our second Munro of the day. Sgurr nan Clach Geala and Sgurr nan Each were prominent in the east. We did not stay long at the summit since dark clouds were coming in from the west. And again – as always in May 2009 – we were caught by a heavy shower of rain turning to sleet and snow later on. The descent of Sgurr Breac’s steep east ridge was quick and in no time we were standing at the beallach at the head of the Allt Breabaig. After some hesitation Frank and I decided to take different return routes to the car. Frank opted for bagging Sgurr nan Clach Geala which I had already done years earlier with Mike. I opted for the return by way of the path by the Allt Breabaig. This leisurely walk to the starting point of our hike was very entertaining since I spent it in the company of a pair of very friendly English hillwalkers. First we used the path, then walked on the banks of the Allt looking for a place to cross it. We discovered some very scenic spots with small waterfalls. Finally we found suitable stepping stones allowing for a more or less easy crossing. Once on the left bank of the Allt we hiked back to the parking on a good path and enjoyed a cup of tea in the couple’s camper van. Thanks for the invitation! Frank, on the other hand, had to complete a steep climb to the beallach between Sgurr nan Each and Sgurr nan Clach Geala before directing his steps towards the latter. The walk to the summit of Frank’s third Munro of the day was completed with hardly any views since the clouds engulfed the upper parts of the hills. However, just as Frank reached the summit the clouds broke and he was able to snap some nice photographs (Brocken spectre) and catch a few glimpses of the surrounding hills. From the summit Frank walked down the fine north-east ridge of Sgurr nan Clach Geala and reached the beallach offering access to Meall a’Chrasgaigh and Carn na Criche. There he turned west into the corrie and reached the path by the Allt Breabaig, crossed the Allt by the bridge and arrived at the A832 about an hour and a half after me. This was a nice day on the hills. It lived up to my expectations and I guess it was about the only walk of this vacation which did not see me reaching the car all wet (and miserable – just kidding)! Description Sgurr Breac and A'Chailleach are western outliers of the Fannaichs, separated from the main group by the pass which goes north from the west end of Loch Fannich to the east end of Loch a' Bhraoin. The two mountains overlook Loch a' Bhraoin, and from the loch they have a craggy appearance. On the ridge between them is the lower top Toman Coinich, and from it a long spur, the Druim Reidh, extends northwards and ends with a very steep rocky prow above the outflow of Loch a' Bhraoin.The traverse of Sgurr Breac and A'Chailleach starts from the A832 road at the point where a track leads to Loch a' Bhraoin. Go along this track, round the east end of the loch and up the path beside the Allt Breabaig to the pass at its source. From there climb north-west then west to Sgurr Breac. Continue westwards along the ridge over Toman Coinich to A'Chailleach. 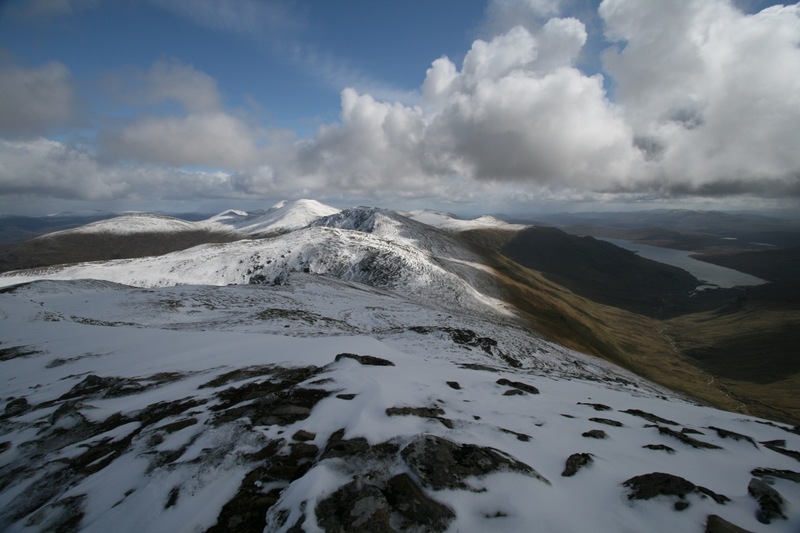 Descend along its north ridge, Sron na Goibhre, for 1 kilometre and then bear north-east down into the Toll an Lochain. Cross the stream flowing from Loch Toll an Lochain and continue a descending traverse northwards to reach Loch a' Bhraoin.